When you have drawn crop lines and want to start over. 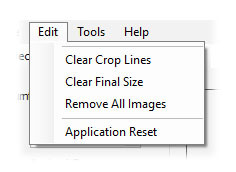 Clears the crop lines drawn, but does not re crop images already saved. Clears the pixel dimensions from the resize entry windows. Does not change any images already saved. NOTE: with cursor over the image you can right click and a menu will appear with options to clear crops and resize entries. WARNING ! , This will in fact clear the current project folder of images. Resets all variables in the GUI to default settings.